Eating more whole grains and vegetables is a great way to lower your blood pressure. Whole grains like brown rice, quinoa, farro, and oats contain lots of heart-healthy fiber to help lower your blood pressure, among other benefits. A variety of vegetables provides blood pressure-lowering fiber, potassium, and magnesium. This salad contains both to pack a healthy punch this spring! Take advantage of the many fresh spring vegetables available this time of year in a delicious spring vegetable quinoa salad that is as easy to prepare as it is tasty. Just blanch the asparagus and peas at the same time and mix up with the rest of the ingredients. The lemon vinaigrette contains only 3 ingredients and no salt, so it’s much better for your heart than bottled salad dressings. Place asparagus and peas into a small skillet or saucepan and cover with water. Bring to a gentle boil and cook until asparagus are bright green, about 1 minute. Immediately remove from heat, drain, and place asparagus and peas into an ice water bath to stop the cooking. Let cool and drain. 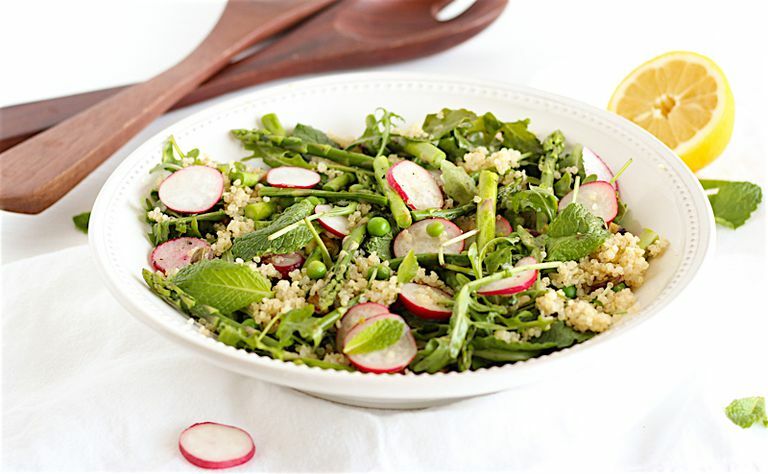 In a large bowl, toss cooled asparagus and peas, quinoa, arugula, radishes, and mint. In a small bowl, whisk together lemon juice, olive oil and pepper. Pour over salad and toss to coat. Refrigerate until ready to serve. You can use any cooked whole grain, such as farro or brown rice, in place of quinoa. For extra protein, add edamame, chickpeas, or grilled chicken. Make a big batch of quinoa at the beginning of the week to make recipes like this even simpler. This bright spring salad is perfect for packing for lunch. The flavors blend even more as it sits in the refrigerator overnight. You can also serve this salad alongside your favorite grilled chicken or fish for a light spring dinner.